Any story that begins with “well, it all started with a moose…” you know is going to be a good story. This week, the blog decided to do something a little different from our typical profile: we’re focusing on robots—beautiful, fantastic robots. And I mean fantastic, in a quite literal sense. To encounter the work of artist Skunk, you’re transported away from the mundanity of everyday life to a fantasy world where junk-metal comes to life and can emote and have a distinctive personality, to a bicycle chopper gang that pilots choppers through the streets of Somerville with the mission to “BUST THE FUNK”. This week, I entered the world of Skunkadelia. Entering Skunk’s world of SCUL (his bicycle chopper gang) and Skunkadelia, his workshop of robots, it’s a little like finding Neverland. Skunk has created this beautiful world for people who are still kids at heart. SCUL is self-described as “an anti-elite group of highly trained starpilots, building and testing the limits of our experimental and augmented ships on late Saturnight missions…”. Their M.O. is to “Be a Superhero Version of Yourself”. I mean, if you didn’t smile at that, do you have a soul? Skunk has this incredible ability to recapture the child-like excitement and imagination that so many of us lose in our day-to-day lives. 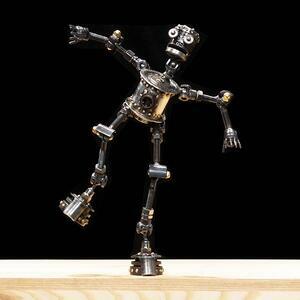 This infectious joie de vive started with SCUL and now has taken on the form of robots. 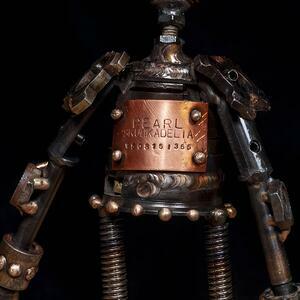 Skunk’s robots are works of art, creations meant to become a part of families. The first thing that really caught me, was the language that Skunk uses to talk about the robots. They aren’t bought, they’re adopted; they aren’t built, they’re created. Instead of grouping them into similar product categories, Skunk groups his robots into families, with siblings who share characteristics and style. If you go on Skunk’s website, you’ll see that each robot has a story and has a personality—some are curious, others are ready to take on the world! When you get to meet the robots in person, you’ll see that the website, as thorough as it is, doesn’t even begin to capture the magic of these robots. 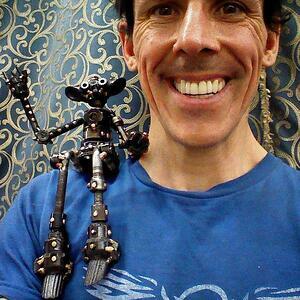 Skunk has taken old bicycle parts and scrap metal, and turned them into living creatures. Even Dr. Frankenstein had to start with real bodies! Skunk has become a staple of Somerville and his work has been seen from venues such as MIT and the Boston Museum of Science, to Adam Savage’s Maker Tour (start around 5:52). Savage was so enamored with Skunk’s robots, that he adopted one, Adrianna! If I seem excited about Skunk’s work, it’s because I am. In meeting Skunk and his robots, I felt buoyant and excited, I felt like a kid again. 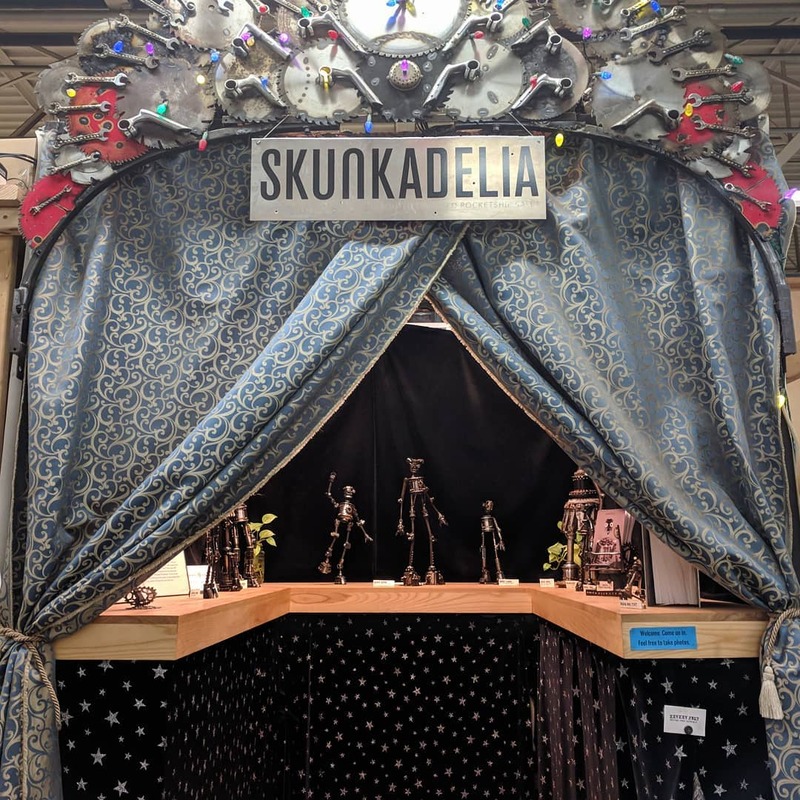 Skunkadelia is a magical world that compels you back to child-like wonder, check it out and see if you don’t find yourself transported. How did you get started welding? When I moved to Boston, my brother gave me a bike and told me I didn’t want a car in Allston and he was right! At the time, he was working at a place called Merlin Metalworks in Cambridge and they made top-of-the-line titanium bicycle frames. As I started riding those bikes I fell in love with them and up getting a job at Merlin next to my brother. At one point, I was working at Merlin and the president of the company walked by and said, “Hey, you’re artistic, you should learn to weld.” and my heart jumped! I was so excited at the idea of being able to do things so permanent like that and the titanium was so beautiful so I learned titanium TIG welding which is short for tungsten inert gas which is incredibly difficult. So much so that when people spend thousands of dollars on a bike, they look at the welds first because that’s a good indicator of quality throughout the bike so people ogle about really nice welds. At the time, nobody could touch Merlin, it was a lot of pressure! I actually now also teach TIG welding to people here at the Asylum. Learning to weld got me into trouble because we were making all of these high end bicycles but then I started modifying junk bicycles. I was influenced by a bicycle chopper gang called C.H.U.N.K. 666 out in Portland, Oregon and they were the first bicycle gang to put any information on the web. 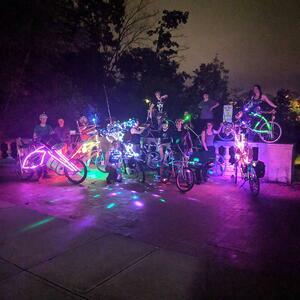 This was back when JPEGS loaded very slowly and you’d see this kind of peep show of bicycles load slowly from the top down and sometimes you’d see something in the bottom of the photo that you just didn’t expect, like someone would be wearing a super-hero cape! C.H.U.N.K. 666 started a culture around bikes and they had this kind of post-apocalyptic ready-for-anything feel, but with SCUL, we evolved differently because I was more interested in having well-built choppers and I didn’t care if we put some money into it now and then. Instead of a post-apocalyptic culture, we toyed around with the idea of being knights on horses and a few other ideas but the sci-fi thing was so much more open-ended for creativity and I’m really glad we went with that because now we call ourselves The Sci-Fi Fueled Bicycle Chopper Gang and that’s how we kind of market ourselves. We’ve now been on a show on PBS called “Design Squad” and we’ve been in the Boston Globe a couple of times and a few others. We recently had our 20-year anniversary two years ago and we’ve just started to get people into the gang who are younger than the gang itself and I just think it’s really cool that we now have an organization that’s older than some of the people in it. We’ve got a huge cultural backlog because at the beginning of SCUL it was just me and a couple of people and so I tried to make myself look big on the internet by writing down everything we did. I’d document every ship that we had (which is a bicycle), every pilot we had and their career and how many points they got doing various things, but it was really just three of us riding around on a couple of choppers I made! As it grew, I kept adding to that structure and at one point a database expert at MIT designed this entire system of keeping track of points. Now pilots are able to login and add their own data and it’s 22 years of history with mission reports and photographs and information on what pilot rode what ship! People have even done research papers on us! There’s something so refreshing about how imaginative and fun SCUL is, it’s like this return to some child-like state of wonder that so many people lose as they get older. Yeah, I like to watch kids and the way they interact with the world because they’re so excited about it and they get excited about things we find boring and gloss over. How many pilots do you have? We have an average of about 15-25. We’ve got a well-trained group crew who really believe in the gang and feel like they have ownership in the group. SCUL is really tight and now the pendulum is swinging towards a little bit larger numbers because we can handle it now, we’ve got the ships to do it. We just need to get people to come in and get trained! We take our training super seriously. Because we’re a gang, if a pilot gets a flat tire we all stop and we all have bags to take care of it, same if someone gets hurt or injured. We have all of these different jobs but we’re all for one and one for all. SCUL works as a unit to co-habitate with all of the other entities on the street and as a result we’re well respected by the public and law enforcement because they know that we’re out trying to be super-pro and we’re not out raising hell, we’re just out having fun. If we go through a residential area, we turn the music off and that’s the signal for people to only talk in whispers. We really try to be respectful. The neighborhood is quite a part of us and we don’t want them to hate us, we want to coexist and have longevity. So, how did you start with robots? Well, it kind of started with a moose! I was welding at Seven Cycles where I work now as a graphic designer, but at the time, I was working as a welder there and it was my friend’s birthday and his SCUL gang name was Moose. It was too late to get a present so I just poked around in a recycling bin and I made him a little moose out of a chain and people thought it was really cool. I enjoyed making this little creature so much that I decided to dedicate some time to make things. After a lot of trial and error, calling my art Skunkadelia because I’d already been going by the name Skunk in SCUL! From there, I started making all of these different things out of reusable materials. I was making little notebooks out of floppy disks and the paper from paper bags and cool stuff like that but people were most excited about the welding-- I was making little robots and little creatures and dragon flies and incense holders. Basically anything a magnet can stick to, you can weld together with a TIG torch and that opens up a ton of possibilities creatively. After a while I kind of narrowed it down into robots, ray guns, and rocket ships and they were really fun but I felt like it was the robots that I got most excited about because I felt like they were alive. It’s really joyous to have this collection of parts that look like miscellaneous drawers of nothing and put them together and have it look at you and emote or look like it has sentience. It’s super fun, way more fun than making a ray gun that could go PEW PEW once. A robot becomes part of your family. People will even crochet them outfits or bring them places! The robots have so much personality! Each robot here looks like they are somehow speaking and communicating. Each robot here looks like they have an incredible story to tell. My favorite robot was Valerie, she looks like she's ready to take on the world. She looks like the superhero version of herself. Yeah, you don’t get that with a rocket ship. I still like the rocket ships because, to me, it’s a symbol of playful adventure and I feel like it’s a symbol to remind people to go out and explore things. The robots are really where it’s at though. I have so many; there are some that roll around, there are some that can fit in your pocket, and then there are some that are posable and it’s really incredible how much a robot’s personality can change just with a small gesture like an arm wave or arms by their side. So I’ve ‘narrowed the brand’ and just started focusing on the robots. 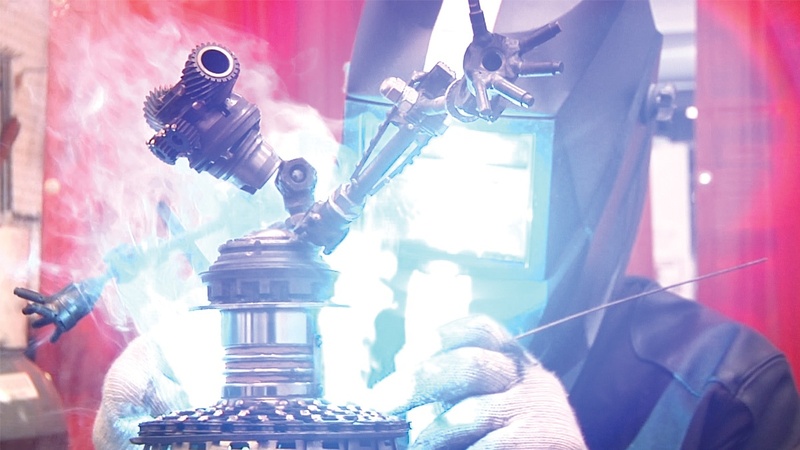 Are you constantly on the lookout for parts or do you look for pieces with a robot in mind or do you sift through pieces until a robot begins to take shape? but soft-spoken. Notice the gentle curve of his fingers. Usually the latter. I have an abundance of metal-- literally tons of steel--that’s all sorted into various ammunition boxes and pull-drawers that are labelled ‘Eyes’ and ‘Hands’ and ‘Legs’! When I’m ready to make a robot, I will pick from drawers that have things that I consider feet at a regular scale but often a hand can become a Princess Leia bun if you use the part somewhere else, but at least I have a general idea of where everything is. It’s different than what most people think of what junk-metal sculpture is: going through a junkyard with a wrench and sifting through piles of metal. That’s not conducive to creativity. I have an incoming donation box that if it gets full I have to say, you can’t give me anymore until I have time to sort through everything! Despite having all of these awesome resources to come by, I’m still desperate for certain parts because there’s kind of a theme going on with bicycle parts in my work and it’s a dream to have a three-speed internal bicycle hub or a coaster break hub, like where the bike will stop if you pedal backwards. Inside the coaster breaks are these beautiful pieces that you can use to make the robots and they can be used as heads or ankles or knees, and so many things! They’re like gold. They’re so amazing and beautiful, and no one sees them so I like to bring them out and make them into something that people really care about and want to keep. Three-speed hubs have tiny, tiny gears that are pretty much my go to eyeballs. Anyways, all of this stuff gets picked out and then I lay it out on the ground, kind of like a dead body except the exact opposite because the robots are becoming born, and I have a custom-building program so people can come by and help pick the parts with me. My latest client is a musician and wants an admirer, so I’m making him a little robot that can sit on his music stand and her legs will have hinges on them so she, the robot, can swing them back and forth and admire his playing. I document everything! I’m on robot 355, Pearl, and if you go to my website, everything is documented and you can see the evolution of the robots! Each robot comes with a name plate that indicates their class and birthdate. A lot of private collections, but I do have a public one right in Davis Square outside of the Somerville Theater, appropriately named Davis and I recently just gave her an overhaul and a pep-talk and brought her back the other day. People really seem to appreciate her! I go by to see how she’s doing often. 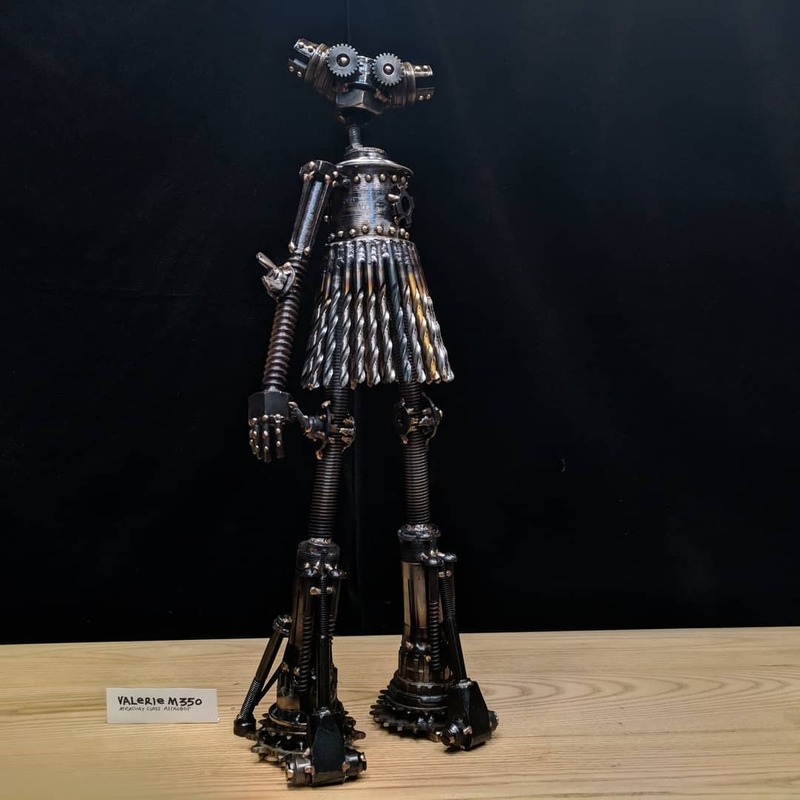 Actually, Adam Savage did a piece on this space recently for his show “Tested”, and he went to all of our booths and in the piece he got really excited about one particular robot I had, Adrianna, so he adopted her! The film crew was there and everyone was so nice and he was so excited about everything in the booth, he was like a kid! It was amazing! He shocked me by asking if he could adopt Adrianna and we had the whole adoption ceremony, when the piece aired I thought he’d cut that part out but it was all there! 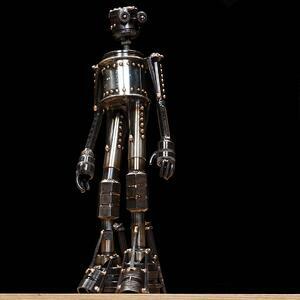 The piece wound up on YouTube and every one of those robots that was seen, was adopted! People just went crazy and I sold out very quickly! I’m trying to create a balance between custom orders and stock robots. 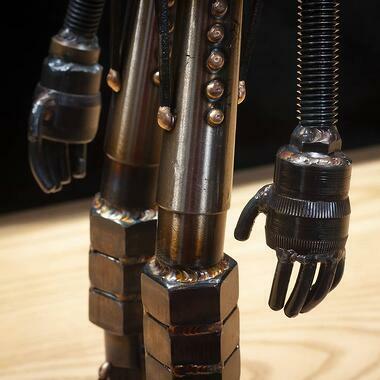 You’ve said that your favorite part of creating the robots is in the eyes and hands, what does that mean? It’s about body language and I really like body language a lot! I think body language is interesting because it’s the language that everyone speaks on a subliminal level. In communication, I think it’s an important part of the bandwidth that two people have when they communicate with each other. With the robots, I feel like I’m only getting one-third the bandwidth, I’m only getting body language, so it’s really important to be precise with their body language. Sometimes the robots will change gender in the middle of the process or sometimes they go from looking brave to looking coy. I usually have an idea of things but the more I bring the robots to life, the less it varies. I’ve had a recent discovery where I feel like the curling of the fingers is really big. If you look at some of the robots, the earlier ones have more rigid fingers and they look more like jazz hands, but then if you look at some of my more recent robots, the fingers are kind of curled and it’s more of a relaxed pose. Without those hands showing, Wilson could be more stiff, but with his fingers curled, it makes it seem like he’s somewhat resting. To make metal look like it’s at rest, that’s a trick and that’s something that I work toward. I won’t bend an arm at an elbow precisely, I’ll give it a curve. By giving it a curve instead of a bend, it implies that there’s a little more to it than just a rod, it implies that there’s muscle, even though it’s all in the brain. Another one is the twist. If you twist the shoulders a little bit, I think that really adds a lot to the body language and the attitude. I think all of these details are important and, in a way, it kind of happens on it’s own but the discovery of the shoulder twist and the fingers, I mean I’m way more excited about that than most people probably are. After 340 or so robots, I think Valerie was the first one. I just got a commissioned by the Independent Film Festival of Boston, to make their mascot which is going to be a fully articulated movie-going robot and they’re going to use him in animations and as an icon for next year’s series which is super exciting. I’ve been doing their trophies since the second or third year since they’ve been around. You can also see my work at the Capitol Theater in Arlington and I keep up on my website so you can see what’s where before you visit. "Hey guys, wait for me!" The tools that I use to make these robots are 50 years old, this could have happened 50 years ago. But I still think I could have been doing this a long time ago. It really connects with the innovative people, a lot of clients of mine are into cutting edge type of technology but I’m really not at all, I’m not doing anything I couldn’t have done 50 years ago. I hate the word product, I mean I could be making toilet paper, but instead I’m making works. I don’t like to think of the robots as ‘sold’, I like to think of them as being taken care of, being adopted. If they really are going to last hundreds of years, they’re probably not just going to have one home, they’re going to have several, I hope. I hope they live these very long and happy lives. They might travel the world, they might not leave Somerville. I’m very happy doing this, it makes me so happy to dedicate time to make these guys and girls.